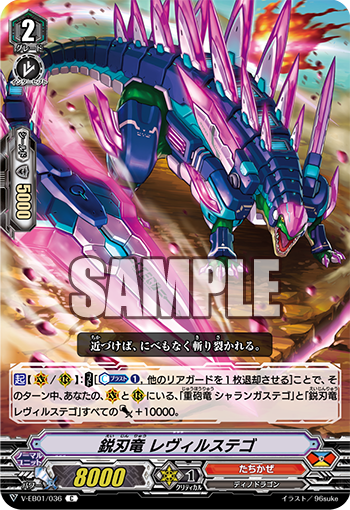 The first Japanese Cards of the Day of June are two Commons from V-Extra Booster 01: The Destructive Roar, the grade 3 Heavy Artillery Dragon Sharangastego and the grade 2 Sharp Blade Dragon Refilstego. Sharangastego is named after Sharanga, the bow used by the god of preservation Vishnu to duel the god of destruction Shiva in Hindui lore, while Refilstego is named after Refil, an alternate name for the sword Ridill used by the blacksmith Reginn to cut out the heart of the dragon Fafnir in Norse myth. (The "f" is pronounced with a "v" sound.) Fittingly, these two Dinodragons are long-distance and close-quarters fighters, though they each possess the same skill to complement one another. This does bring up an important point regarding clans that use retiring as a cost: unlike other clans, Tachikaze, Shadow Paladin, and Great Nature each have the ability to give up a long-term booster in order to gain short-term power. In order for this to be a worthwhile play, the unit sacrificed has to contribute less power on that turn than what you would gain through the retire skill. So killing an 11k booster on par with Lion Mane Stallion or Aermo would be a total waste, while a vanilla Draw would be the perfect target. 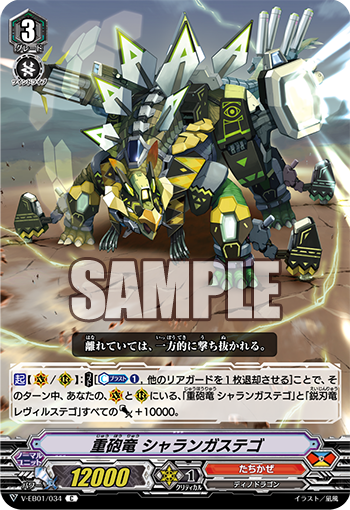 The previous Japanese Card of the Day was Machining Mantis.